Ruunvald Excavation is a cave located east-southeast of Shor's Watchtower and north-northeast of Riften. It is where Florentius Baenius is being held captive. There are two internal zones Ruunvald Excavation and Ruunvald Temple. † He relocates to Fort Dawnguard after being rescued here. This location is named Ruunvald Ruins prior to the start of the related quest and the entrances are locked and require a key. The excavation is high in the eastern mountains, due south of Kagrenzel, the Dwemer ruin. Beside the entrance is a large tent containing two unowned bed rolls, used by those on guard duty, protecting the site from bandits and animals. The excavation was started by a team of Vigilants of Stendarr, lead by Moric Sidrey. Inside the tent, by the bed rolls is a dawnguard war axe, a pair of steel cuffed boots, two green apples, an apothecary's satchel and a Volk's journal. The journal is by Volk, who was one of the guards, and one of the last to enter the cave. In front of the tent is an old extinguished campfire and a banner hanging from a tall post. There is a lone snowberry bush behind the tent, along with several crates and unusable barrels. The entrance consist of typical wooden doors seen on mines throughout Skyrim. Upon entering you are in a supported tunnel descending to the north, leading down to a wooden ramp descending around the outside wall of a large chamber. Ahead is what appear to be one of the Vigilants of Stendarr, standing facing away from you at the entrance to another tunnel opposite. The ramp continues down past this tunnel to the ground far below. It transpires that everyone within the site has been charmed and will attack you on sight, you are unable to talk to them. To the right of the first charmed Vigilant is a crate holding a journal Discovering Ruunvald, Vol. I, which is written by Moric, in which he documents the early progress of the expedition. There is a second charmed Vigilant at the bottom of the chamber, who will also attack you on sight. There are numerous crates and barrels on wooden platforms at the bottom of this chamber. There is also an unowned bed roll and table, with a pair of boots and a pickaxe beside the bed roll. To the right of the platform is a malachite ore vein. The tunnel heads north and eventually opens out into a wider tunnel, where several barrels, crates and an empty cart are stored. There is a charmed Vigilant patrolling this part of the tunnel. Just past this it descends further, passing another cart on your left containing three pieces of malachite ore. Ahead is a junction, the tunnel turns west, but take care a there a tripwire across the passage. There is another charmed Vigilant on the right mining a malachite ore vein and a alcove in front containing an unowned bed roll beside a table holding an empty burial urn, a garnet, a silver necklace and three loose septims. Under the table is another loose coin, with a second burial urn to the right and an unlocked chest to the left. There is an oil slick on the ground and an oil lantern hanging above, which is released by the tripwire. The tunnel continues to the southwest, passing several crates and barrels. On your right, on a crates is a Scroll of Bane of the Undead, a Scroll of Turn Undead and a small coin purse. The tunnel turns left again, with a burial urn and an unlocked chest in front. Just after the turning the tunnel opens out into another large chamber, with a central rock pillar and plenty of wooden support beams. There is a charmed Vigilant mining a malachite ore vein below you. A ramp leads down on your right. At the bottom, there is a charmed Vigilant patrolling the chamber and a husky further back, who may be alerted by any fighting. To the right of the ore vein the Vigilant was mining is an open crate containing a piece of malachite ore. There are several pickaxes found around this chamber. On a wooden platform to the west is a bed roll, with a barrel and crates either side. On these are a random potion of true shot, a quiver of steel bolts, a random potion of magicka and a random potion of stamina. 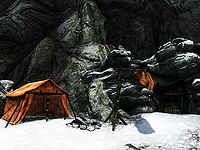 Behind the central pillar is a lean-to with a bed roll under it and a crate beside it holding Discovering Ruunvald, Vol. II, which documents the success of the expedition, but also mentions losses of time and headaches. To the east is another narrow tunnel that takes a couple of turns before entering a wider section that has been completely floored out with wood. In front is a ramp down to a burial urn and an adept-locked chest. Beyond this is an alcove on the right, with a charmed Vigilant sitting at a table with a medium coin purse on top and three unowned bed rolls beside it. There is also a husky in this alcove. Once past this the tunnel continues to the east before turning north once again, by a fish barrel and a barrel of ingredients. The turning leads to another wooden platform running around a chamber with a ramp leading down to the right. There is a charmed vigilant at the bottom, where you will find a food sack and barrel, under the ramp and to the south is a large urn beside a set of shelves holding ten common books, and with a long wooden table in front holding Discovering Ruunvald, Vol. III, which is the first to mention Minorne, in fact they seems to be constantly in Moric's thoughts. To the west the tunnel is double width and filled with crates, barrels and sacks, with two pillars of earth and rock supporting the ceiling. Take care as there are a total of three pressure plates on the ground one on either side of the first pillar, which trigger a single crossbow bolt from mounted crossbows on the ceiling and to the right respectively. A third pressure plate, where the tunnel narrows triggers two crossbow bolts from two mounted crossbows on barrels in front. They will all only fire once each and the crossbows can all be taken. Past the pressure plates the tunnel turns south, with a malachite ore vein in a short section to the north. This next section of tunnel begins to show signs of a Nordic barrow and a large chamber ahead has a wooden bridge suspended across from east-to-west. There is a charmed Vigilant wandering across the bridge and many others nearby. Any fighting is likely to involve several of them, including Volk, the author of the journal found outside, converging on you. On the western side of the bridge is a ramp leading down to the bottom of this chamber on your left, two empty open crates and an unowned bed roll to your right and at the back is a small room containing an unlocked chest, and a burial urn in the niche by the "window" overlooking the main room. In the corner, by the ramp leading down is a square wooden table holding a random potion of magicka, a random potion of stamina and a small coin purse. The ramp descends to a walkway that is still above the ground and another suspended bridge that crosses the room north-to-south, before another ramp leads down to the east. In front is a cart filled with rocks and a piece of malachite ore. A tunnel leads further down on your right. Behind the cart is a skeleton crushed under a cave-in with a pickaxe beside it. Against the south wall is a square table and chair, with a burial urn beside them. The western half of the chamber is a couple of feet lower than the eastern half, both have tunnels heading north that are linked. In the northeastern corner is an alcove containing an owned single bed, an empty chest at the foot of the bed, with a small table and chairs and two food barrels and three sacks beside it. On the table and one of the barrels are two bottles of Nord mead, a small coin purse, a bottle of Honningbrew mead, and a honey nut treat. To the south in the western half of the chamber is a passage with distinctly Nordic architecture leading to doors to Ruunvald Temple. Just before reaching the temple door passage is a copy of Discovering Ruunvald, Vol. IV on the last barrel to the right at the wooden structure. Through the door is a passage after a short distance it is staggered to the left. On the corner is a carved stone head with an elk's skull and horns in front, candles on either side and a book entitled Minorne, written by Moric, extolling the virtues of Minorne, who has obviously charmed everyone within the excavation except Florentius Baenius, who has been locked up for still praying to Arkay. On the left in front of a second carved head are three burial urns. The passage descends a flight of stairs to the south and enters a split level room containing Minorne, Moric and one other charmed Vigilant. Wooden stairs lead down into the room. There are two large urns in the southwest corner and wide stairs leading up to the east. At the top there is a cage on the right that is locked and requires a key, which is carried by Minorne. Florentius is in the cage, speak to him to advance the related quest you were sent here for. On the lower level beneath the cage is an iron door which is also locked and requires the same key as the cage. It opens into a narrow passage and after a few turns leads to a large room. Around the room is an unlocked chest against the east wall, two empty sideboards, an unowned single bed, a large urn, a stone table, with an alchemy lab built-in and a lever that raises part of the floor, revealing a spiral staircase. On the table are two random potions of magicka, a potion of stamina, a random empty soul gem and a copy of The Aetherium Wars. The stairs lead down to a narrow passage and an iron door, locked with the same key again and outside in the mountains via an alternative exit, which is a short distance south of Tolvald's Cave. Prior to the start of the related quest, discovering the location will not add the map marker to your map. The nearest discoverable place is Tolvald Cave. The entrance only appears after the quest has been started, so siding with the Volkihar clan makes it impossible to enter the excavation. In the battle in the Temple, it is only necessary to kill Minorne. Once she is dead the remaining enemies will also drop dead. The copy of Discovering Ruunvald, Vol. IV often clips through the barrel, making it almost impossible for console users to obtain. The Unrelenting Force shout or a Fireball spell can be used to push the book back towards the outer edge, where it may clip back through just enough to be grabbed. Sometimes upon entering Ruunvald, usually after killing the two charmed Vigilants, the game may freeze. ? Advancing the related quest with the console should work around the problem. Once you have fed on any of the corpses of the Charmed Vigilants in Ruunvald Excavation as a werewolf, you will have a permanent glowing red mist around your head just like the Charmed Vigilants. ? There are 2 deleted navmesh in the vanilla DLC when inspected in TES5Edit. These deleted navmeshes are associated with the DLC1RuunvaldExterior01 cell. This is a potential related cause for reported freezing or crashing in this area of the game world. The DG.esm has two deleted navmeshes in [CELL:0000BBA5] in worldspace WRLD:0000003C at <44,-15> ? This page was last modified on 28 February 2019, at 11:51.